1. Unlined Hardcover Notebook - A notebook can be used by anyone for lists, slices of life, prayers, doodles and more. 2. Burt's Bees Almond & Milk Hand Cream - It has a nutty almond scent and makes dry hands feel good again. 3. Sharpie Extra Fine in black ink - It's the right marker for almost everything. 4. Strawberries - What could be better then fresh strawberries? 5. Crayola Erasable Pencil Crayons - When you like to add color to your journal, note, or lesson plan, they are the perfect pencil crayon. They allow you to change your mind! What fun it would be to really go to a Favorites Party! Love the things you're bringing to the party! If only, we could do this...for real! I just bought baby gifts for two expecting friends. I indulged and got them my favorites- sun hats, polka dotted socks, and favorite books, of course! They will love their baby gifts! Thanks for being here, Fran. You will love your sharpies and pencil crayons! 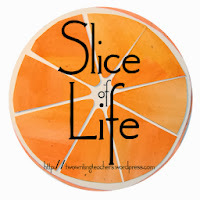 This slice idea has been so much fun to participate in - and yes, wouldn't it be fun to actually to do it! I am going to have check out that hand cream. Thanks for "attending" my party, Loralee! I joined the party today, too. How fun it would be for real! It would be so much fun, Diane! I'll be there tomorrow, Loralee. Can't wait. I'm glad you're bringing lotion, love that! You just made me smile! Love your fun additions, especially the hand cream and strawberries. What a lovely, indulgent evening we'll enjoy together! I'm smiling and imagining all the fun! I am responding to Leigh Anne's invitation today at my 15th day slice. I like the thought of having a real party rather than a virtual one but virtual will do.